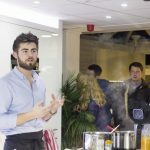 Kitchenology opened their doors on the 31st of January and 1st of February for a weekend of food inspired events starting with an exclusive evening with Masterchef Finalist 2014, Jack Lucas, followed by an open day of foodie fun and temptation! 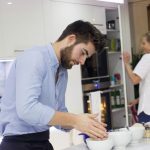 On Saturday evening Jack Lucas certainly showed his skills in the kitchen creating a menu of roasted butternut squash risotto with pancetta, goat's cheese beignets and rocket, rack of lamb with redcurrant glaze and simple no cook lime cheesecake with tropical fruit coulis and popping candy. 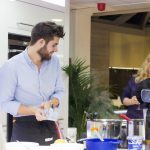 Our guests were treated to a display of Jack's expertise and were taught how to get the most flavour and the best results out of their ingredients. They were also shown professional techniques such as making caramel and how to smoke lamb with hay to add flavour to the dish. Of course no cookery demonstration is any good without a great deal of food tasting! We enjoyed sampling all of the amazing dishes Jack created which certainly tasted as good as they looked. Jack was highly entertaining and took time to answer questions throughout the evening. 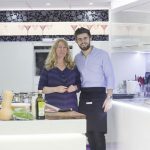 He shared some insights into his culinary world and together with his expert tips, we all felt we could achieve similar results at home.